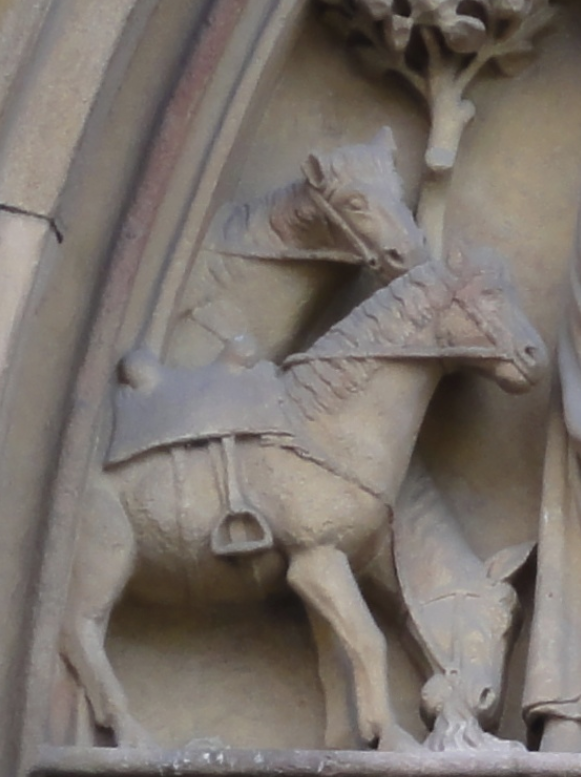 today we will travel back to the European Medieval equestrian imagery, this time from the Gothic period of the Medieval art. Namely, the Saint Martin de Tours Collegiate Roman Catholic church at Colmar, Alsace region of France, has some amazing art that has survived the upheavals of history, including the barbarian period of the French Revolution and destruction caused by those son of liberty and progress... It used to be the home of this amazing Northern Gothic painting by the Colmar native, Martin Schongauer, called Madonna in the Rose Garden - a bit more here. But now it can be viewed at the Dominican Church . The western fasade (face of the building) of this Gothic church has a portal, with several lovely horses carved inside the tympanum (the nativity scene, showing the Magi paying homage to Christ etc) and a gable with a mounted figure of Saint Martin de Tours sharing his coat with a beggar. 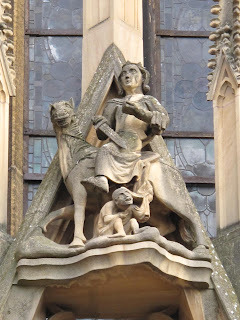 Firstly, our warrior Saint Martin from the gable. The spirited horse appears to be a riding horse or a palfrey and perhaps a gaited horse (his legs somewhat indicate this). It is unclear if his bridle has a snaffle bit or a curb-bit, while the breastplate-crouper arrangement is typical for the period (we get some detail as to their attachment to the saddle tree). The rider is using a relaxed, deep seat, with his legs somewhat flexed but extended (sort of a Dom Duarte's variation) and firm in wide-base stirrups. No spur is visible. The Unterlinden Dominican Convent Museum (famous for the Isenheim Altarpiece) houses a damaged statue of Saint Martin, sculpted circa AD 1300. Interestingly, all three mounts of the Magi have bridles with snaffle bit, while the saddles are typical high arches affairs, with only the breastplate visible, but we get a nice view of a stirrup, and the saddle-skirts as well as the double girth arrangement. Horses have a look of a palfreys and thus are noble riding horses, but not the dextrarius or war horse appearance. I was there recently, but my own pictures are not adequate so I am using Wiki Commons collections, eg (1)- for which I am grateful. 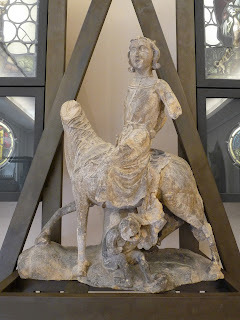 by accident I stumbled upon this unusual or rather bizzare Medieval art artifact - Judensau, prevalent in the Holy Roman Empire and adjacent countries, that also can be found at Colmar's Saint Martin church - a photo here.